reported to be one of the oldest in the city. the success of the community. father, Calvin, who operated the La Porte Hotel. come out here as soon as you can." Vermont to Indiana took nearly two weeks. the building trades, he was advised by a doctor to find another occupation. then merged with Rush Medical College in Chicago. decided to follow some of his Indiana friends to Wisconsin. the hill on what is now Mill Street. was sorry for you, but I could not help you only to give you needs." service, or purchased on credit until crops or animals could be sold. pharmacists in La Porte, Indiana. was to give them quinine. practiced medicine in the Evansville and in the Albany area. extended from West Main north to the mill pond. worked on the house himself. to accommodate the horses and grain storage. mother, Martha Evans Whitman, had recently died of consumption. home further west on Main Street where she lived until her death in 1877. Sarah married and moved to Chicago. Kindness to family and friends was one the characteristics of young Dr.
little excess money he had help others. Medical College, Evans gave him the funds. doctor throughout his early career. helped to consecrate the Lodge's hall on October 5, 1852. In 1857, he joined the Knights Templar order of Masons in Janesville. help protect the children living in that area. 1855, the firm dissolved and Evans and Emma moved back to Evansville. Once more took up residence in the brick house on West Main Street. 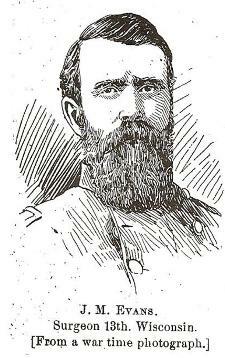 third child, John M., who was born in November 1858.
became the surgeon for the Regiment that went into camp at Janesville. hard toll on the doctor. medical school, had completed his studies and was practicing in Evansville. He lived in a house on West Main Street, directly across the street from Dr.
territory opening up for settlement. Evansville. Jacob West had been given the responsibility of collecting Dr.
claims are forever lost", West wrote to Evans. and her children visited in Indiana. make room for more spacious dwellings some houses were moved. Dr.
Quivey's house was sold to a Mr. Plaisted and moved to a site near Dr.
moved ten rods north of its original location. and barns were built in the village that had been named Evansville in 1855. Progress could be seen on every street. a visit for his wife and children to his army camp. cloves, pepper and snuff were rubbed into the cracks of the floor. was giving good milk and was sleek and fat. Dr. Evans returned home from the Civil War to find a changed community. would increase the mill's power. When Dr. Evans returned home from the Civil War, he joined Dr. Charles M.
those who had died in defense of their country. have to care for the horses and vehicles. attend to his duties as a physician if he was serving in the legislature. the praises of the prosperity of the county. went to Rush Medical College in Chicago to train to become a physician. When school was not in session, John, Jr. worked with his father. In 1877, Lizzie was married in her parent's home. Her husband, DeWitt C.
Evans and Smith and was hired on the recommendation of Dr. C. M. Smith..
his family east. DeWitt and Lizzie's marriage was troubled and did not last. Evansville to live with her parents when the marriage ended. in corn and 1/2 acre in potatoes. the political and patriotic speakers who addressed the crowd that gathered. Evansville Cornet Band concerts and ice cream socials. weather. In 1881, southern Wisconsin was the scene of a terrible blizzard. doctor could tend to the sick. convenient" for the aging physician and his wife. style was the Methodist Church. cut-work wood piece at the apex of the gable. water was supplied from two large rainwater tanks in the attic. next few years. A small one-story porch was added to the home in 1885.
being active in promoting public improvements. later, and the cost was nearly double the 1892 proposal. added his name to the roster to strengthen the public's trust in the facility. 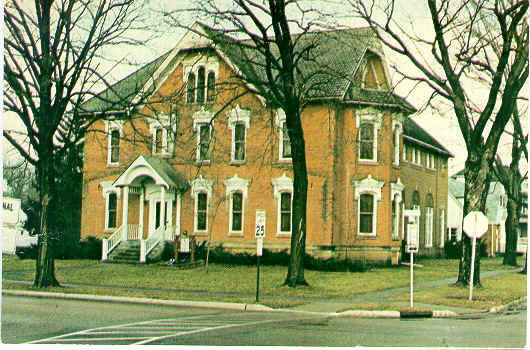 The adminstration of the hospital was in the hands of Dr. John M. Evans, Jr.
block 2, running north from Garfield Street. The first to purchase building lots were John P. Porter and Dr. John M.
Antes purchased a lot facing North First Street. fellow residents and chosen as Evansville's first mayor. women on the school board was praised by Mrs. Minnie Savage. once been planted on the grounds of his home. guard over the body, first at the house, and later at the Episcopal Church. The Masonic order took the remains to the church for the funeral service. P. C. Wilder, Mayor of Evansville, gave the following tribute; "Dr. J. M.
other compensation from the estate. wing of the building and tore off the old brick north wing. was to be used for lodge meetings. built on the north wall of the north wing. placed on the 1922 improvements to the building. Masons also added a large porch and furnished it with wicker chairs. having now a brick temple, which will last for generations to come." integrity of the building for future generations.